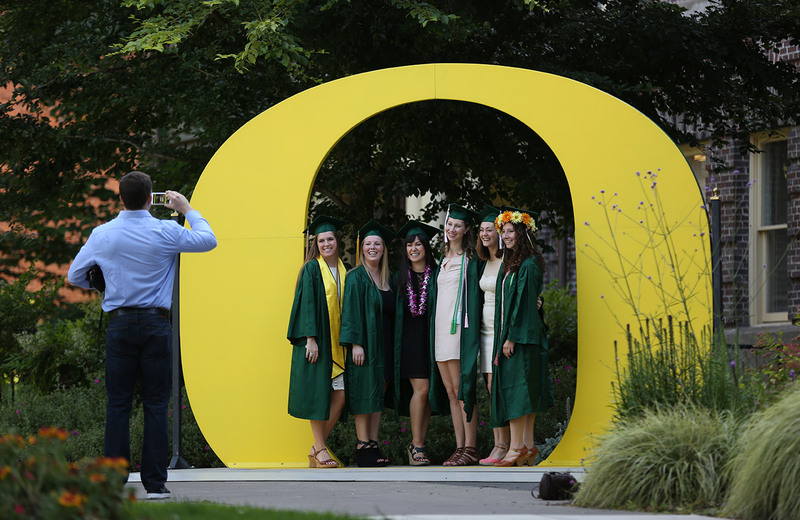 The University Ceremony on Monday features a university-wide celebration to honor all graduating Ducks at the end of spring term. The event is in addition to department ceremonies throughout the weekend. The University of Oregon hosts more than 40 school, college, and department ceremonies, sharing the commencement celebrations with more than 5,000 graduates and 30,000 guests. These ceremonies usually occur following the last day of spring classes through the university-wide celebration on Monday. Formerly, the institution hosted a summer commencement ceremony. Students graduating in summer or fall may participate in spring term ceremonies. The University Ceremony celebrates the accomplishments of all of our graduates with a great deal of excitement, student speakers, and a keynote address in preparation for the provost conferring the degrees to the graduating class. Graduates meet at the corner of 13th Avenue and University Street to join the Duck Grad Parade lineup, which will travel from the Erb Memorial Union to Matthew Knight Arena to begin the ceremony. Graduates are encouraged to get creative and decorate their grad caps and regalia. Tickets are required for guests at the ceremony. With over 40 school, college, and department ceremonies, graduates celebrate this day alongside their peers. Department and program faculty are present to recognize the graduates as they receive a diploma cover and “turn their tassel” to mark the transition from student to graduate. These ceremonies typically last around 90 minutes. Each school, college, or department plans its own ceremony. As these ceremony times, dates, and locations are finalized they will appear in this list. Please contact your department directly if you have any specific questions regarding these ceremonies. In between ceremonies, join the campus community in celebrating commencement at the Erb Memorial Union (EMU). Stop in to enjoy the GradFest activities including photo opportunities with the large green and yellow "O.” The newly renovated EMU also includes places to sit and relax and expanded food service venues. Other food options include Dux Bistro in the Living-Learning Center and Carson Dining, which will be open for students and guests. Coffee and snacks will also be available for purchase at the Student Recreation Center. All university museums and classroom buildings will also be open for you to enjoy during commencement. Join your graduate in taking a final look at their home as a Duck and enjoy our beautiful campus!